Attorney Kenneth Tomchin is one of only 18 Jacksonville lawyers certified by the Florida Bar as a Specialist in Business Litigation. He and the rest of the firm seek to resolve clients’ legal conflicts as expeditiously and cost-effectively as possible. 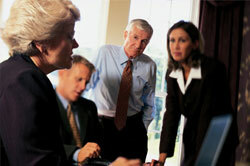 The lawyers also work with area or out-of-state attorneys who require co-counsel or local counsel assistance. Please inquire about construction litigation and banking litigation services, as well.